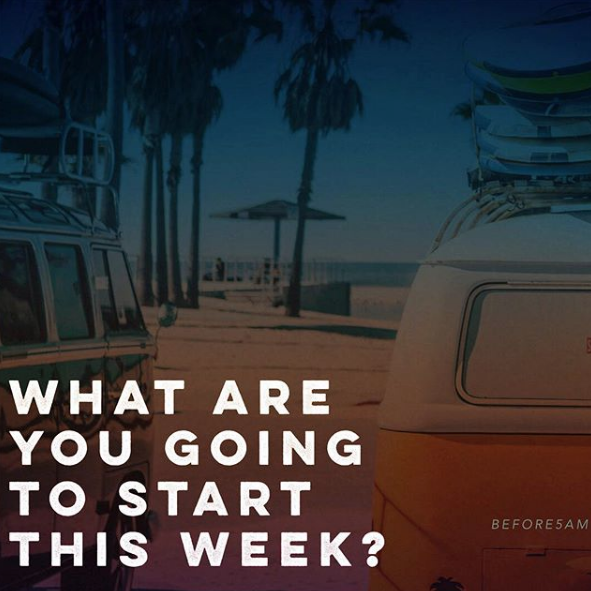 What are you going to start this week? ~ I mean really.... What are you going to start? ~ You've talked, you've whinged, you've kinda tried, you have ideas that can change the world, you have big dreams. But where have they got you up to this point? ~ So the time for talking and thinking and dreaming is OVER! ~ This week you're going to start something BIG, something you are passionate about and something you believe in! ~ I don't care about your past performance or current circumstances. What I care most about is your potential and what you can do! ~ If you want to start a clothes designing business, lose weight, become an astronaut or start writing a hit cartoon for kids then this is the week to START! ~ Forget the past! ~ Forget what else is going on in your life! ~ START NOW! ~ For those of you who are brave enough to START tag me in your pictures and show me your progress, I'm on a mission to make sure you live your DREAMS. ~ Let's have a great week and let's make BIG things happen. Mar 26 Trap LA Exclusive!! Wendy's Throws Shots at McDonald's with Mixtape, "We Beefin?"